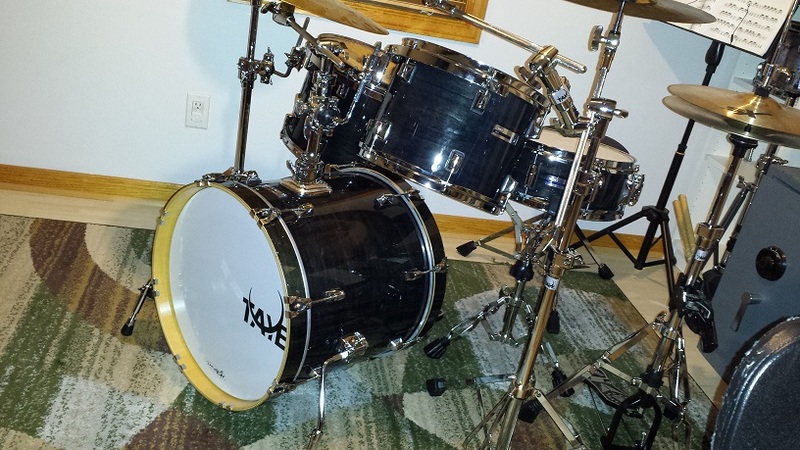 ProX 418F (4-piece, 18″ Bass, Fusion) is the specific model number of the drums covered in this Taye ProX Review. Interestingly enough, you won’t find that particular configuration anywhere on Taye’s website. The six example configurations covered on the site are 420F, 520J, 522S, 524C, 522C and 622S. The first digit denotes the number of drums, the following two digits correspond to the size of the bass drum and the final letter describes the style; F: Fusion, J: Jazz: C: Classic and S: Stage. As it turns out these six listed configurations are just examples and numerous additional combinations of the available components in each series are available to order as pre-configured shell packs. “Configuration Friendly” is the term Taye coined to describe this. The benefit to us customers is that just about any configuration of the available sizes in each series can be ordered without the extra cost, lead time and hassle of a custom order. Further it turns out that some Taye dealers not only list, but even stock a large selection of these combinations. For me, it means that I could get my hands on a kit of particular specifications without having to custom order, puzzle it together, or augment an existing kit with add-ons. 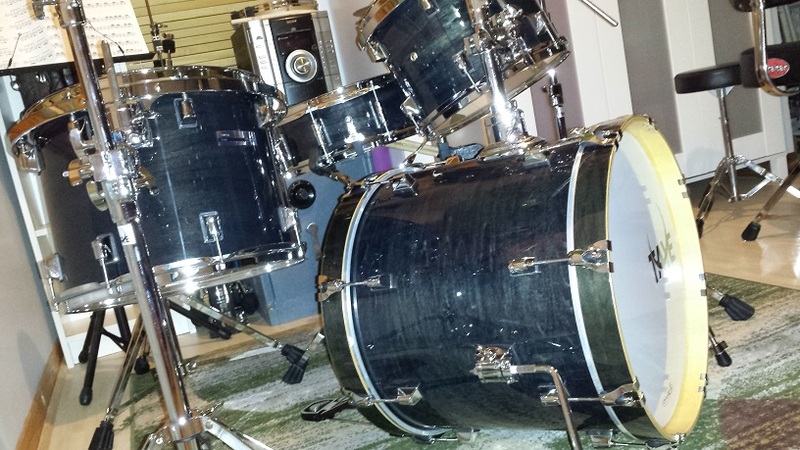 The configuration I’ve been wanting to get my hands on is 18″ X 16″ Bass, 12″ X 9″ Tom tom, 14″ X 11″ Hanging floor tom and a 13″ X 5″ Snare drum. Not exactly a commonly found pre-packaged kit. With sizes determined, there are also selections of wood species available; Poplar, Birch/Basswood, Birch, Maple and Maple/Birch as well as the choice of wrap or lacquered finishes. Of course budget as well as tone will to some degree affect this choice. You can also choose between a bare shell pack or a complete kit with hardware. I think I’m starting to see what “Configuration Friendly” means. 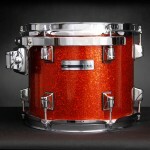 Street price for this configuration is $600 for the shell pack or $720 including hardware. 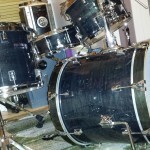 The ProX series kit reviewed here are birch/basswood hybrid shells with a dark grey gloss lacquer finish and hardware pack. My favourite part of reviewing drums is experimenting with tunings, testing what pleasant and unpleasant sounds can be wrung out. Gauging sustain and resonance as well as tweaks to increase or decrease overtones and ring. 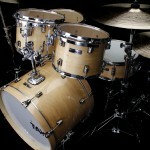 Assessing the range at which a particular drum can be tuned and still produce a clear sustaining, distinct tone. How dynamic and sensitive they are as well as how loud or soft can they be played. It’s always tempting to immediately set up a kit and start trying out every possible option of sounds. However if I start there, I may never get to the time consuming and tedious exercise of examining the shell interiors, bearing edges, metal components and overall build quality. To have the patience to measure every shell’s roundness and document the “flatness” of all the bearing edges, I have to discipline myself to perform those tasks first and then get into the enjoyable duties as a reward. Thus the drums get unpacked and immediately loose their heads, rims, snares and anything else between our prying eyes and the secrets hidden within the shells. Each shell is then placed on a 24″ X 24″ granite slab (Verified for true “flatness”) and any gaps between the bearing edge and granite measured with a “feeler gauge”. After this process we take cross measurements across the diameter of the shells using the lug screws as guide and take note of any discrepancies. 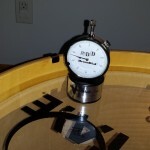 Four lug screws per drum are subject to random tests for “tightness”. 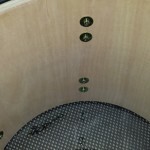 Before re-assembling the drums, each shell interior gets inspected visually and by feel. The same visual and “feel” inspection also applies to the bearing edges. 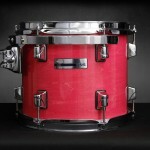 Starting from the outside of the shells, the grey gloss finish is completely flawless on every surface of all drums. We have not been able to find a single imperfection in the gleaming finish. This is one of those rare cases where the marketing pictures on the website are a true representation of the actual product. If you click the picture of the tom to the right for a full size view, this is what the drums look like all around and everywhere. Turning our attention to the metal parts, three pairs of eyes scouring every angle of each component, in the end managed to turn up one pin-head sized blister in the chrome on the tom mount platform. Apart from said 0.5 mm dot the chrome is as flawless and perfect as the rest of the finish. Inside, the shells appear to be sealed with a satin finish clear coat. The surface is perfectly uniform with seams visible to the eye but not detectable by feel. We recognize the same sealer both from Taye’s GoKit and StudioMaple lines. Overall the shell interiors are as flawless and perfect as the outsides. Lug screws are tightened to about the same torque as I exercise when assembling. Well past snug but not overly tight. All the screws checked were tightened uniformly. The bearing edges are the same shape as we’ve observed on other Taye kits we’ve inspected. Fundamentally they are standard 45 degree with 45 degree bevels, but sanded into a smoother profile. Not quite rounded over but smoothed over enough to increase the head-to-shell contact compared to a standard 45 degree bearing edge. The entire bearing edge surface is smooth as silk, with a surface resembling the satin finish interiors. On this kit the bearing edges are completely without flaws. Not a blemish, nick, dent or other imperfection to be found. 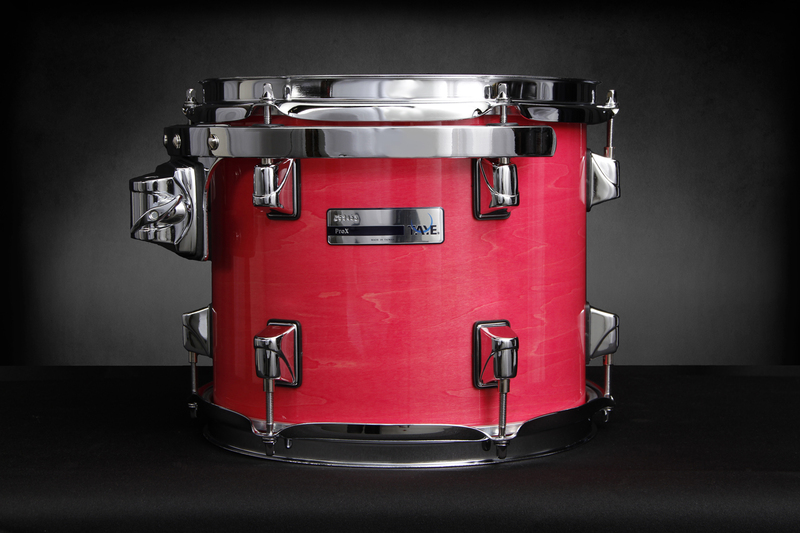 The term “butter soft” has been used to describe Taye’s bearing edges in a review by Drum! Magazine a while back. Seems to be a good a description as any. The snare beds are just the way I like them, a couple of inches wide with a gradual slope on both sides and no deeper than about 1 mm. Now to the nitty-gritty. The details, the whole skinny… How “flat” are those bearing edges? How round are those shells? 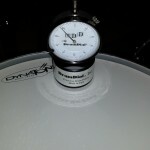 As a general guideline, for an intermediate kit, up to 1.5 mm discrepancy is acceptable in either direction on an 18″ bass drum. 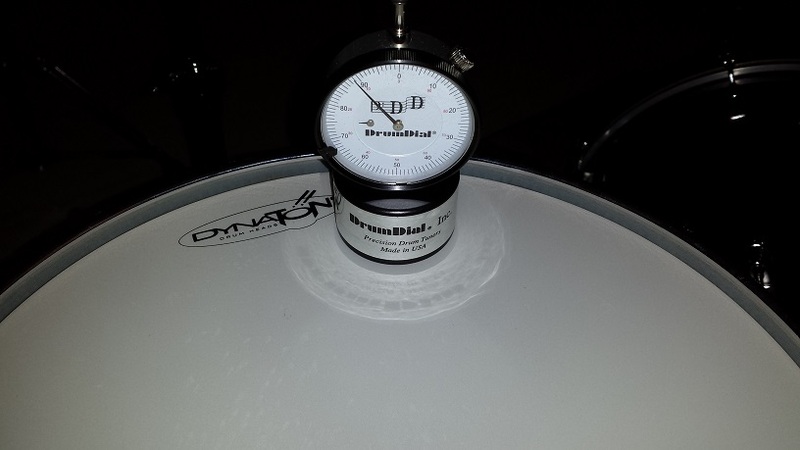 The toms and snare should measure less than 1 mm deviation. 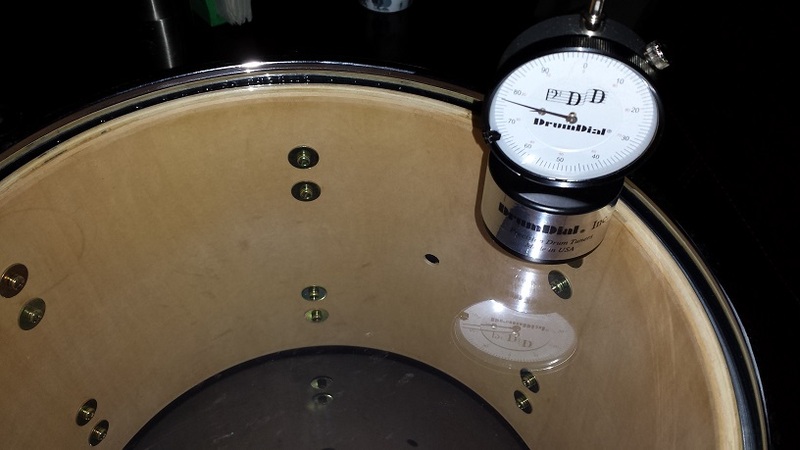 The subject ProX bass drum displayed less than 0.8mm “out of round” and no measurable “out of flatness”, That’s pretty good, but it gets better still. None of the other shells had any measurable discrepancy, either from perfect roundness or perfect flatness. 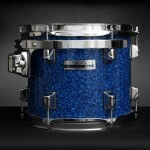 Results this good are rarely found on an intermediate kit and better than acceptable even on high end drums. Impressive! 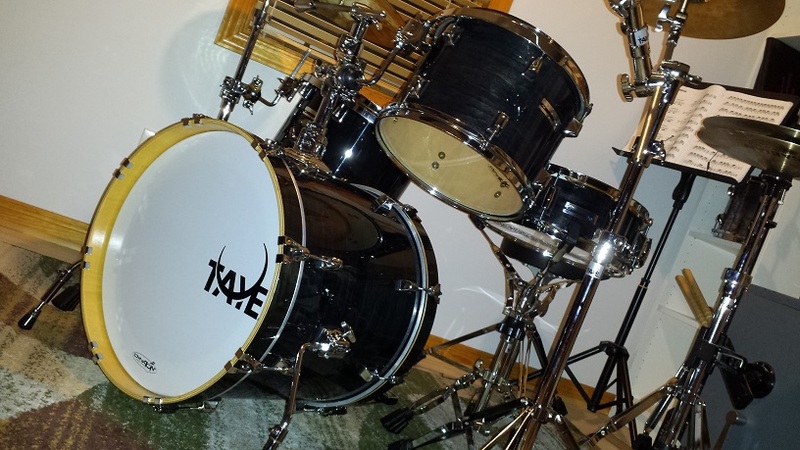 The most noticeable differences between the ProX and Taye’s High-end offerings being the Tom mount platform and the wood species. 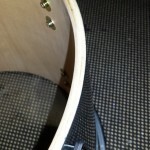 While the wood can often be a question of preference and not always an indication of price level, the “Slide-Track” mounting platform found on the higher end kits is a tangible upgrade. 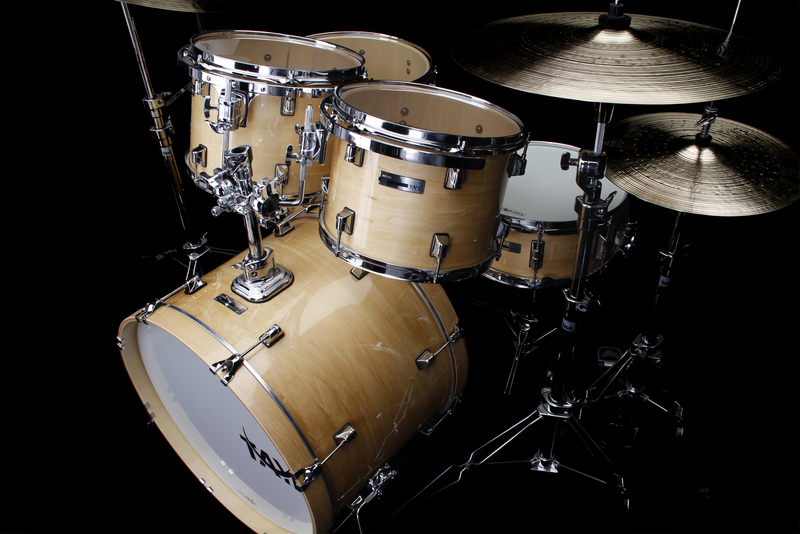 Taye’s unique SP90 bass drum spurs not only improve bass drum resonance, the sleek design enables the player to easily position stands in and around the bass drum. 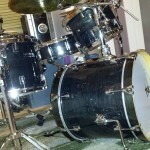 Retractable spikes eliminate bass drum movement. An industry standard, SuspensionRings™ allow mounted toms to float freely, providing optimum tone and resonance. Simply designed for optimum performance, this side-action release system employs a minimum of moving parts. With a large knurled tension knob for easy snare adjustment, and our unique SlipLock feature that prevents unwanted loosening of snare tension, SideLatch™ is strong, smooth, and flawlessly reliable. 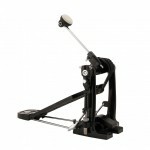 Virtually eliminates the need to disassemble claw hooks and tension rods from bass drums when changing heads. The Articulated Claw Hook is designed to isolate the claw from the wood hoop, preventing unwanted tonal interference in live or studio applications. Patented studded lug gaskets remove any metal-to-wood contact allowing the drum to resonate more freely, delivering optimum sonic performance in all environments. Another Taye innovation. With no internal pressure points, PocketHinge™ effectively distributes force across a wide area of the rod to which it mounts, delivering dependable, slip-free performance. Engineered For Sound. Among other innovations, Taye EFS™ utilizes cross-lamination in the shell formation process. 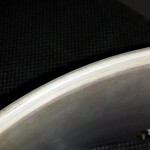 Cross-lamination is the method of perpendicularly alternating the direction of the wood grain within the plies, providing drums with extremely rigid shells, resulting in breathtakingly broad tuning ranges. While some of these features may seem less significant than others, I appreciate the “leave nothing to chance” attitude. For example; the inherent flex in the bass drum spurs might not have any significant impact on resonance, but if it can aid even the slightest little bit, then why not? They also provide telescopic height adjustment which isn’t usually found on “swing-away” spurs. The “SideLatch” strainer works very well in every way. Tension adjustment is smooth and the entire design is straight-forward with a minimum of moving parts. A light flick is all it takes to disengage the snares while still firmly holding them engaged. Another practical innovation are the claw hooks that swing away without having to unscrew them all the way. While not a huge scientific leap, it does save time and prevents having to look for that eighth tension rod that rolled in under the stands during head changes. Since there is still indirect metal-wood contact between the lug screw washers and the shell, Taye’s studded gaskets certainly go a long way to reduce said wood-metal contact. Another example of their “leave nothing to chance” attitude. All mounting brackets are equipped with “PocketHinges”. Simply put it’s an internal curved bracket latched on one end and tightened by the screw on the other. It does indeed as promised hold a rod rock solid without having to tighten ‘until your knuckles turn white. Just “snugging” the thumb screw is more than adequate for a firm hold. Cross lamination is nothing new and certainly not unique to Taye. I do believe they have the process just about optimized though. More on this in the “Tone and Tuning” section below. 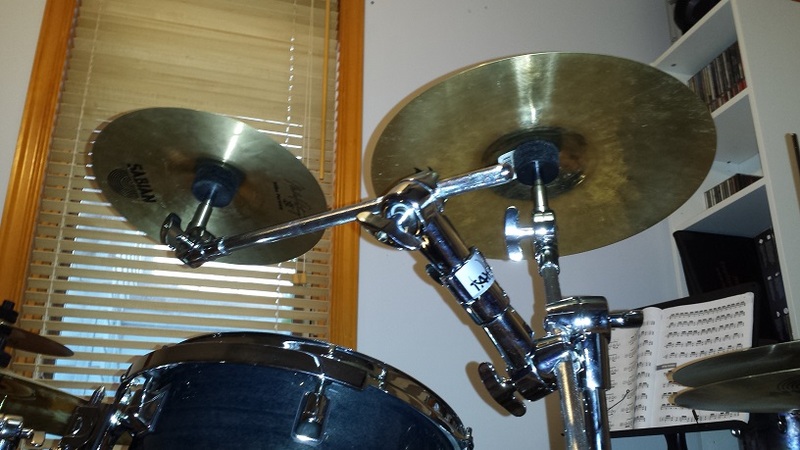 Rack toms are all mounted with standard ball-joint L rods that function well. Like the rest of the metal parts, since they aren’t from one of the factories that deliver these items to most of the other brands, they have their own distinct visual character. 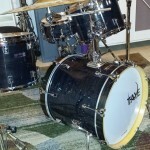 The toms have single ply heads of medium weight on both sides. The heads on the bass drum are both pre-muffled with perimeter rings. Clear on the batter side and white on the audience-facing end and of medium weight as well. 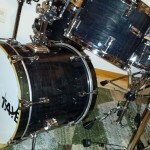 A common trait with all the drums in this kit as well as just about any Taye drum I’ve tinkered with, is how low they can be tuned. 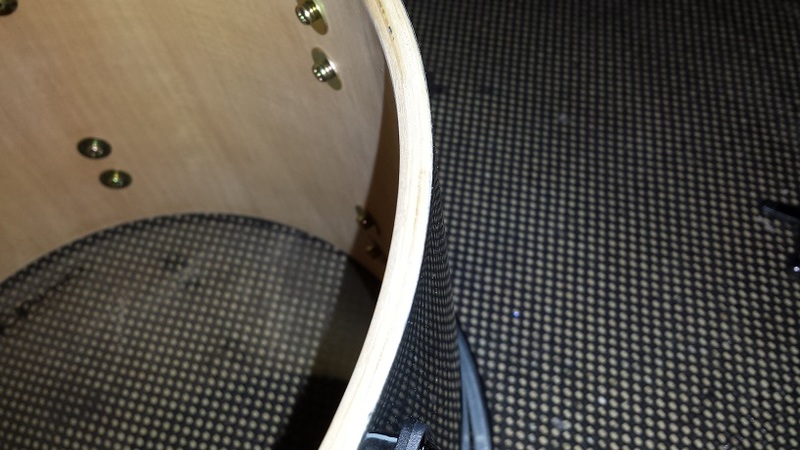 When installing a head the drum will produce a clean distinguishable and sustaining note when tapped gently with the tension rods just finger tight. This is just speculation but I attribute this to a combination of factors. 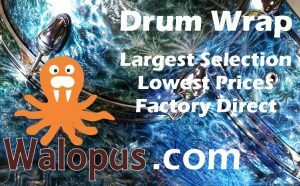 The first and most obvious that these drums are well within tolerance margins in regards to roundness and bearing edge flatness. The second I attribute to the shells. They have a “solid” feel and sound “tight” when tapped. I suspect this is a reflection of consistent high quality both in wood selection and manufacturing. Third, I believe has to do with the slightly rounded over bearing edges, marginally increasing head-to-shell contact without hindering the heads ability to resonate freely. I’ll do my best to describe the character of each drum. Keep in mind I have a predisposition towards birch/basswood shells. While different wood types lend character to the sound of a drum, I’ll attempt to convey these drums tone without blending in to much of my bias towards the birch/basswood flavour. Starting with the tom tom, after the inspection described above I re-installed the heads and tinkered with lower than useful tunings for a bit. Really just playing around and getting to know my new friend. 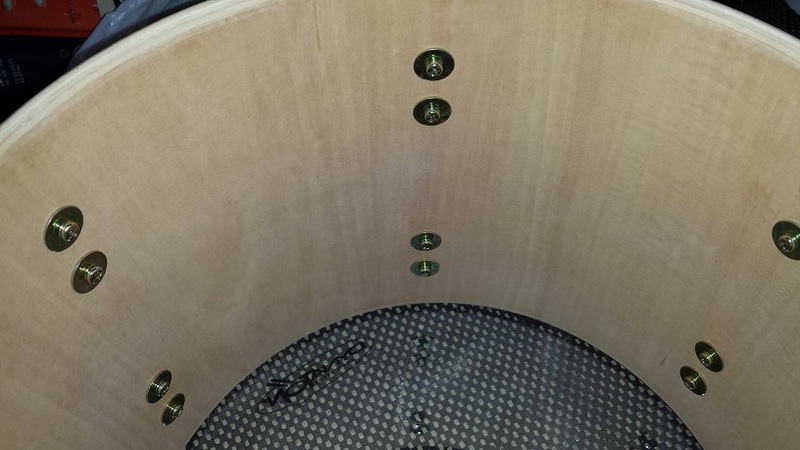 Next I seat the heads and gradually start tuning the tom up to more useful ranges, for the most part keeping the resonant side tuned a bit lower than the batter head. The amount of sustain is quite easily controlled with the difference between the heads. The tom sounds rich and full all the way from below useful range and up to our destination of fairly “high”. 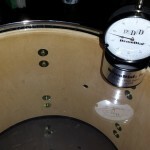 (Bottom head 75 and batter 78 on the DrumDial.) 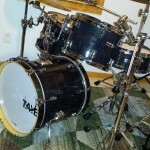 This is just about my usual tom tom tuning and I find it to be universal enough for the eclectic array of improvisation we tend to jam out here at CompactDrums.com. 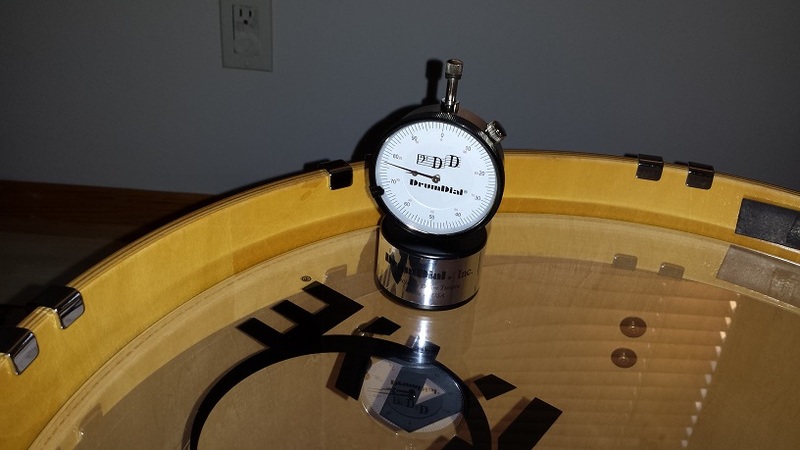 Tuning the resonant head closer to the batter head increases sustain gradually and controllably. Just as increasing the distance has the opposite effect. Some care needs to be taken when adjusting the distance as those spots that cause a “whaaa whaaa whaa effect” are very pronounced. Sustain can be tweaked to past undesirable levels. At higher tunings the drum continues it’s even, uniform travel up the frequencies but a bit more precise tweaking is required if overtones are not desired. By the time any “thudiness” starts to show signs of choking we are well past any range I’d ever want to tune to. 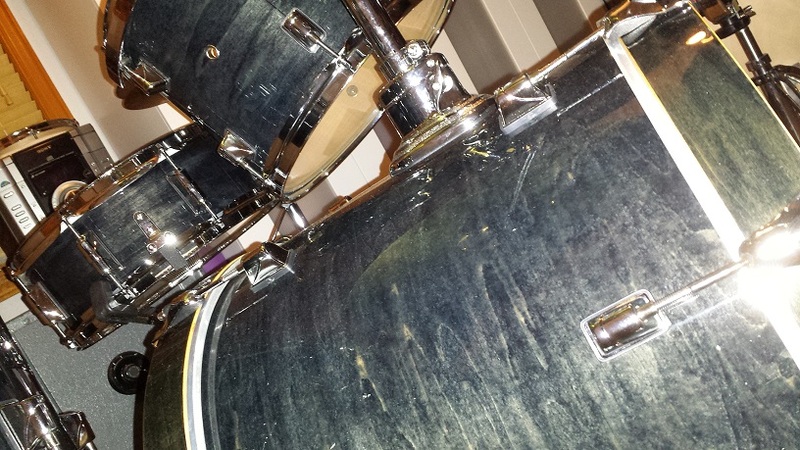 One of the things I like about using a hanging rack tom as my floor tom is the ease of matching it’s tone to the high tom for perfect sounding transitions between the two. 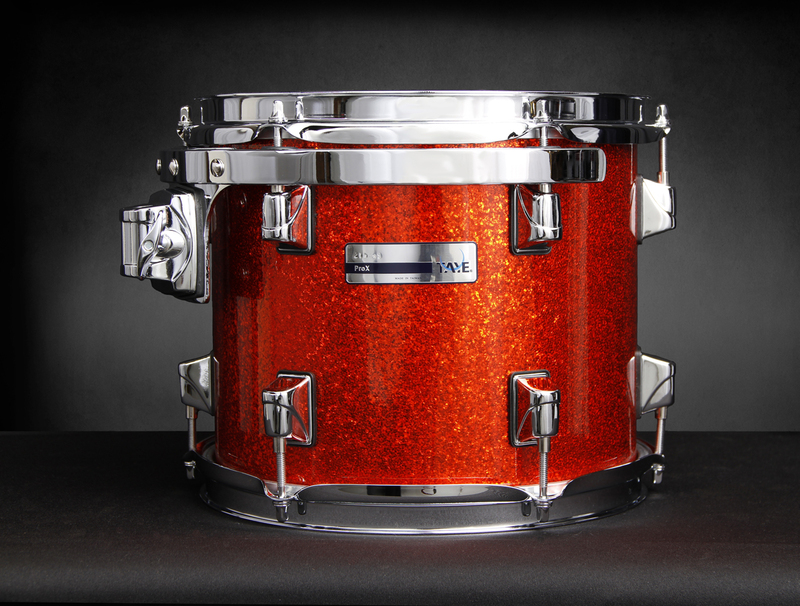 The ProX 14″ X 11″ tom does indeed blend perfectly with the tom tom as well as mimick it’s character through the same tuning range. 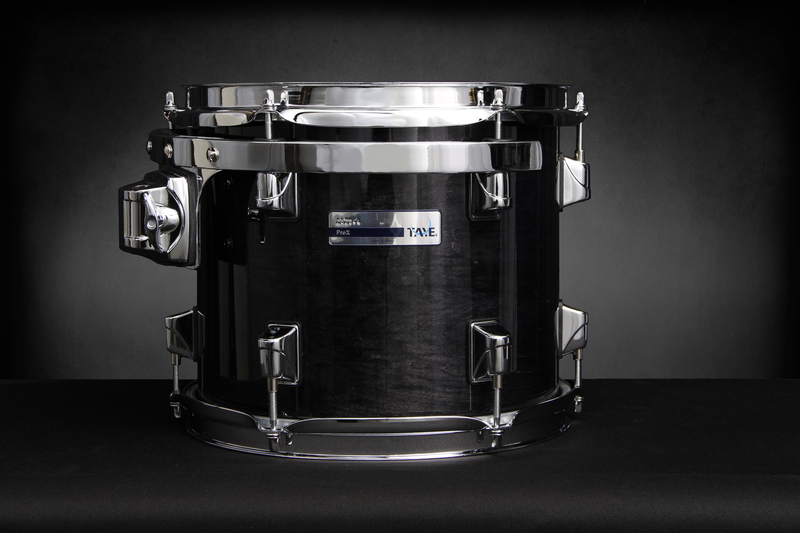 The 13″ X 5″ snare drum has a distinct personality all it’s own. 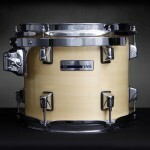 Like the toms it produces real drum tones with just finger tight tension rods and offers the same broad tuning range. Tuned low to medium it’s fat and meaty with more “chomp” than “bite” Tuned more average the crack becomes sharper and more distinct. Where it really shines though is tuned high. 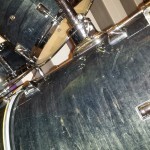 With the snare side head just about screaming for mercy and the batter head at around 78 on the DrumDial it has a sharp, crisp crack that can be tweaked to a resonant “pang” or a mess of both desirable and undesirable overtones. All depending on your definition of desirable. At certain points it almost had a steel snare “metal-clang” to it. 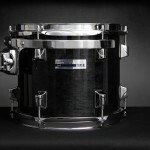 This snare has instantly won me over and become one of my favourites. 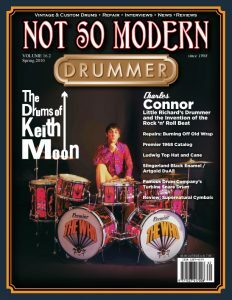 Surprisingly, despite 1.6 mm rims on a 13″ snare, cross sticking yields clear and articulate “clacks, clocks and clicks” without even reversing the stick. 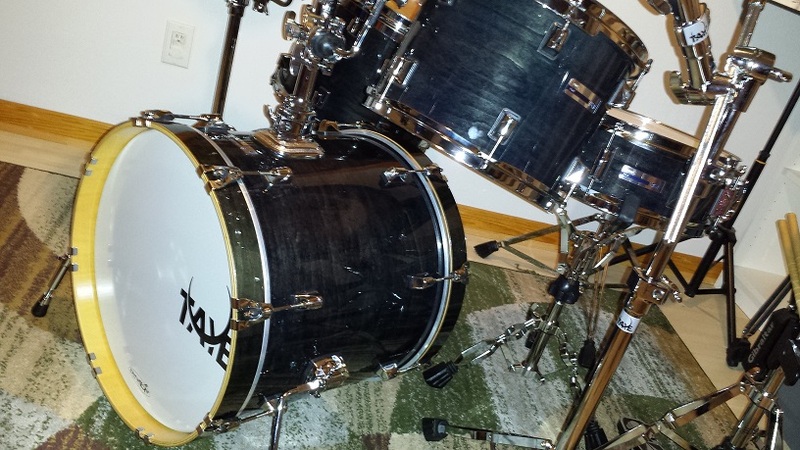 My few interactions with Taye’s bass drums have always been of a positive nature and this one is no exception. Here’s an example of where the lower end of the tuning range can be put to use. With the tension rods just barely finger tight on the resonant side and a quarter turn past finger tight on the batter side, a big, chunky, somewhat muffled rock bass punch is instantly achieved without additional muffling. Gradually increasing the tension on both sides transitions the drum up through the frequency spectrum in an even manner without any “odd” spots along the way. Overall it sounds bigger than it’s 18″ diameter suggests. Leaving the resonant side just past floppy and only adjusting the batter side works well too, allowing for higher tunings while maintaining control of ring and overtones without resorting to blankets, pillows, felt or tape. 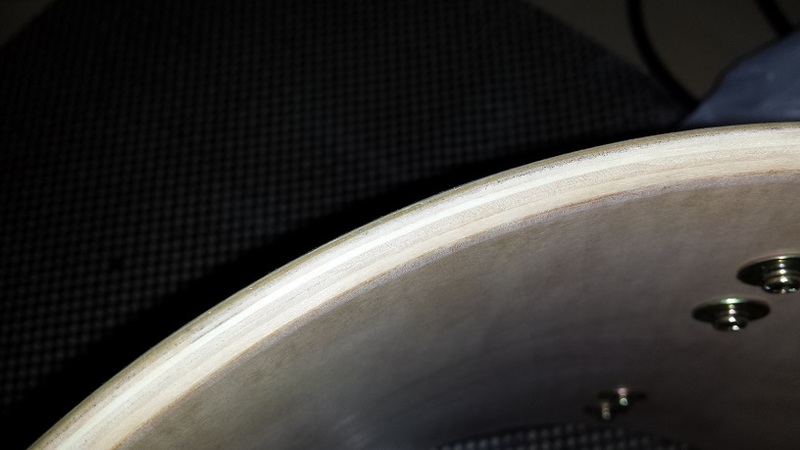 My own personal observation is that the bearing edge shape Taye uses lends itself particularly well to the bass drum. To sum up tuning and tone for the entire kit in one word, I would use “flexible“, or perhaps “adaptive“. With the right tuning and maybe an additional set of heads the sound of this kit can be shaped to suit just about any genre or style of music. 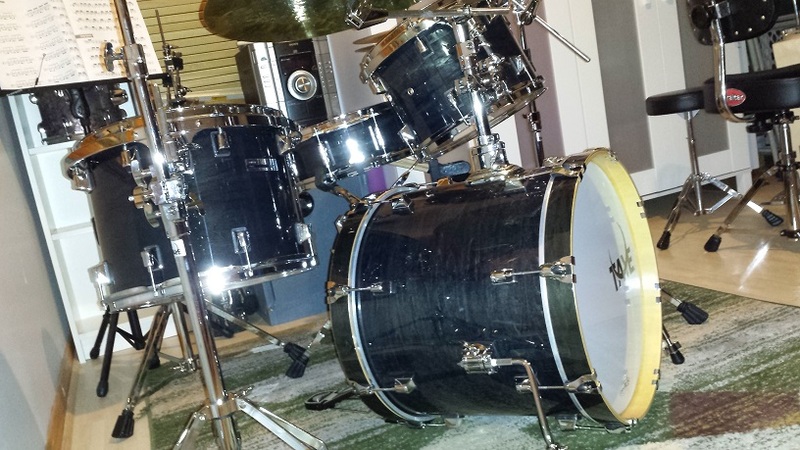 Each drum has a very broad tuning range all the way from rumbling low to squealing high. In addition the drums respond equally well to light touches, moderate taps and outright abusive blows. Experimenting with different batter/resonant tunings adjusts sustain and overtones in either direction. The latter is especially noticeable with the snare drum. I even managed to make it mimic a “pick-a-bau-bau”-like sound of a funk bass. “High-end features, high-end finishes, but without the high-end price, ProX was designed with the player in mind. 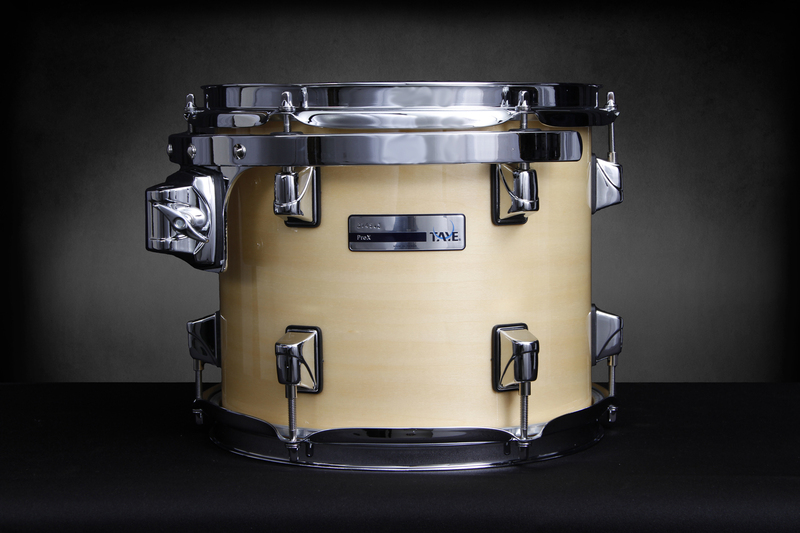 ProX shells are constructed of birch and basswood producing a tonal quality that incorporates the brights of birch, and due to the inherent properties of basswood, the lows associated with mahogany, making it extraordinarily adaptable to any musical genre. And, ProX is packed with many patented innovations that have made Taye a leader in sound and functionality. On our test kit we are also using Taye’s ACS-PK008 to hold a splash in the centre of the kit. This handy little contraption adds a dimension to the common “Extra Cymbal Holder Concept” by allowing rotation of the dual sided clamp-bar. Taye have a whole range of equally useful accessory clamp solutions. As mentioned in the Introduction for an additional $120 it’s hard to resist getting the hardware pack with the ProX kit. Hardware Pack C consists of a straight Cymbal Stand, a boom Cymbal Stand, Snare Stand with ball-joint, Adjustable Tension Hi Hat Stand and of course the Bass Drum Pedal. All components in this pack are of the double-braced 5000 -series, which are one of Taye’s intermediate pre-packaged hardware sets. The cymbals stands are solid and of good quality, just about as expected from intermediate stands. The ball joint on the snare stand is a nice touch that I’m already familiar with. It allows infinite adjustment with just one thumbscrew without the need for repositioning the base or rotating the second tier. Taye’s bass pedals and Hi Hat stands have become my go-to hardware choice. Having tried both the 501 and 601 bass pedals and 4000, 5000 and 6000 series Hi Hat stands. The bass pedals have the feel of much higher priced “boutique” pedals, offer infinite adjustment, and are smoooooth. 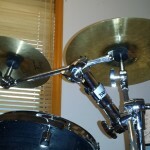 The same can be said for the Hi Hat stands throughout the three series, while of course displaying varying duty levels. 4000 series is lightweight and great for portability while the 6000 is like a truck. The one used in this review of course falls in-between at balance-point between the two. 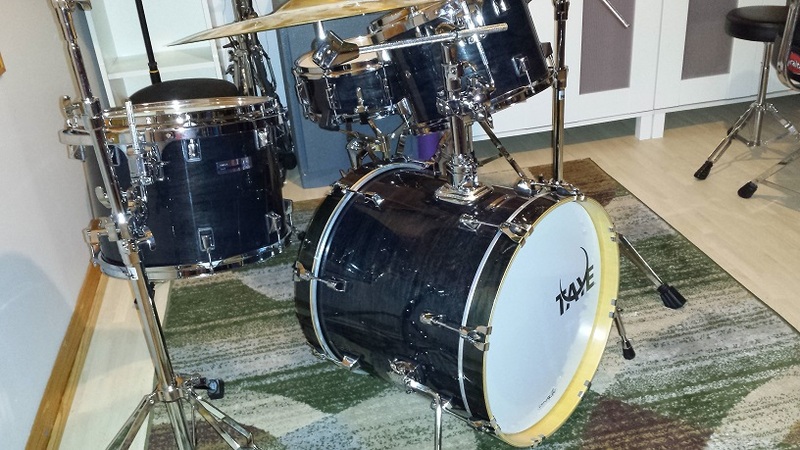 In summary, This 5000 series hardware pack is outstanding value and especially the snare stand, Hi Hat stand and pedal are more impressive than the intermediate label and pricetag would suggest. 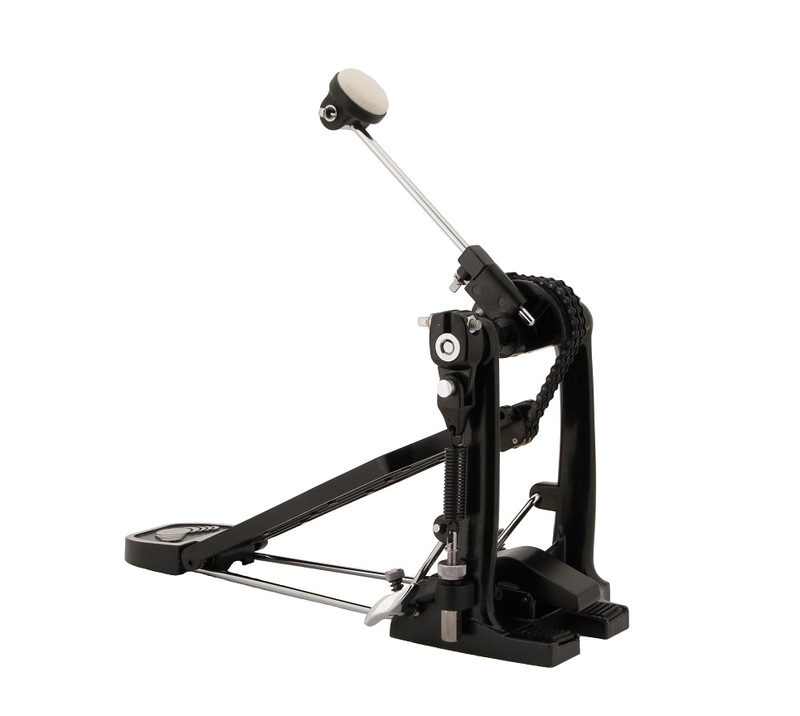 The petite little beater on the bass pedal is perfect for delicate and intricate drumming but may be subject for replacement with your favourite sledgehammer for heavier rocking. Looking back at the Quality and Tolerances section of this Taye ProX Review, I think it would be challenging to find another contender in this price range that can challenge the ProX’s level. I’d go as far as saying the ProX is rivaling kits closer to $1000. Sound-wise the verdict is of course more subject to personal preference. 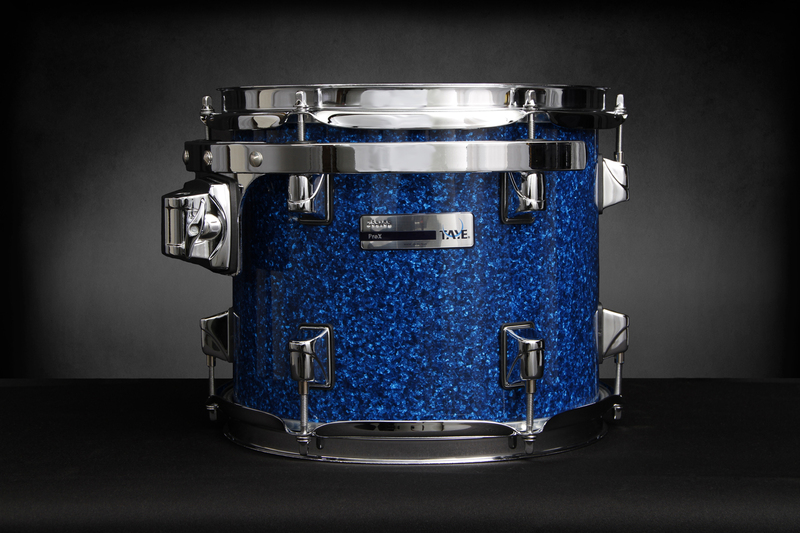 As much as this kit is versatile and flexible, if you’re looking for a distinct maple, or other particular sound, the birch/basswood blend might not deliver exactly what you seek. 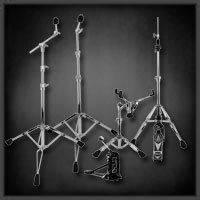 However if you’re in the market for drums with a broad range of sounds that can be adapted to multiple styles and situations, I would take a second look at the ProX. From a pure features, specs, and design perspective, the ProX is a sound and solid contender. For me personally it’s a hands-down winner. Overall value for money is hard to beat as well, when you combine the high build quality, extensive feature list, Perfect tolerance measurements and broad tonal range, it becomes hard to believe that this is a $600 shell pack. 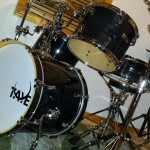 I think that even if you have a budget that far exceeds this range, the Taye ProX deserves consideration, you might just find it more appealing than that $1,200 kit you’ve been eyeing, leaving you with a nice budget for a $120 hardware kit and cymbals too!